I've been eating a lot of eggplant lately. I guess because it looks so fresh. This recipe is another from Giada DiLaurentiis. It is hearty enough to eat as a main dish. Just serve it with some crusty Italian bread. Place a grill pan over medium-high heat or preheat a gas or charcoal grill. 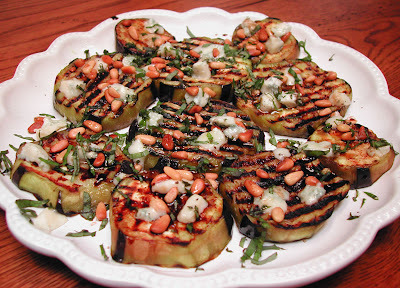 Drizzle the olive oil over the slices of eggplant and toss to coat. Grill the eggplants until tender and grill marks appear, about 3 to 4 minutes per side. I used cooked them for about 5-6 minutes per side. Place the eggplants side-by-side on a serving platter. 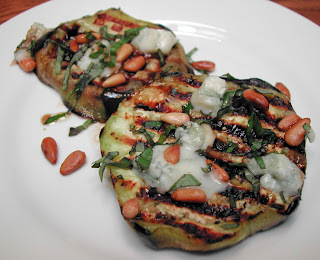 Sprinkle with the pine nuts, goat cheese, basil, and mint. Drizzle with extra-virgin olive oil, balsamic vinegar, salt, and pepper. Did you put sauce on the eggplant? Looks very tasty, as always. Bambola, Your right and I did! Emilie, Nope, no sauce, just balsamic vinegar and olive oil. YUM.